Takeaway food for snobs? Yes, it does exist. 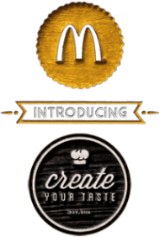 Yep – Mamamia’s podcast queen Monique Bowley is a staunch food snob – so getting her to try McDonald’s new Create Your Taste menu was kind of a big deal. And we don’t want to give the results away too much – but let’s just say that these days, you can be a food snob AND still eat at Maccas. Are you a food snob? Would you try this new menu? Mamamia’s Holly Wainwright is a health conscious mum, and she has discovered the ‘adult dream burger’.